Not a bad deal. Compression was light, so if you want more, this glove is not for you, unless you have large hands. I have thin hands. My hands did warm up in this glove. Odd thing tho, where my arthritis is the worst, at my thumbs, the glove made me itch. I think it is the copper, because I have trouble with the metal on earrings too. Keeps the pain in joints to a minimum. Pain almost eliminated after use daily for stitching. Best I have tried. These Gloves Are Life Saving!!!! About these gloves WOW! I'm an automotive mechanic and after beating on ball joints and other parts on vehicles for over forty years I use to wake up in the mornings with my hands swollen and would not even move, I had to run hot water over them before I could use them. Then I found these life saving gloves and after wearing them over night the next morning, NO PAIN, NO STIFFNESS, Totally Incredible. Thank You, Allen Hill from Saint Peters Mo. I bought these for my left hand because I broke it last year. My hand does feel better because the glove supports it. 1 hour after using these incredible gloves my hands went from extreme pain and swelling too completely pain free and after 2 hours all the swelling was gone. Thanks you Walter Drake for the most incredible product I have ever bought online. I loved them so much I bought 4 more pairs for people I know that's in pain. Thanks again Allen Hill from Saint Peters Missouri. 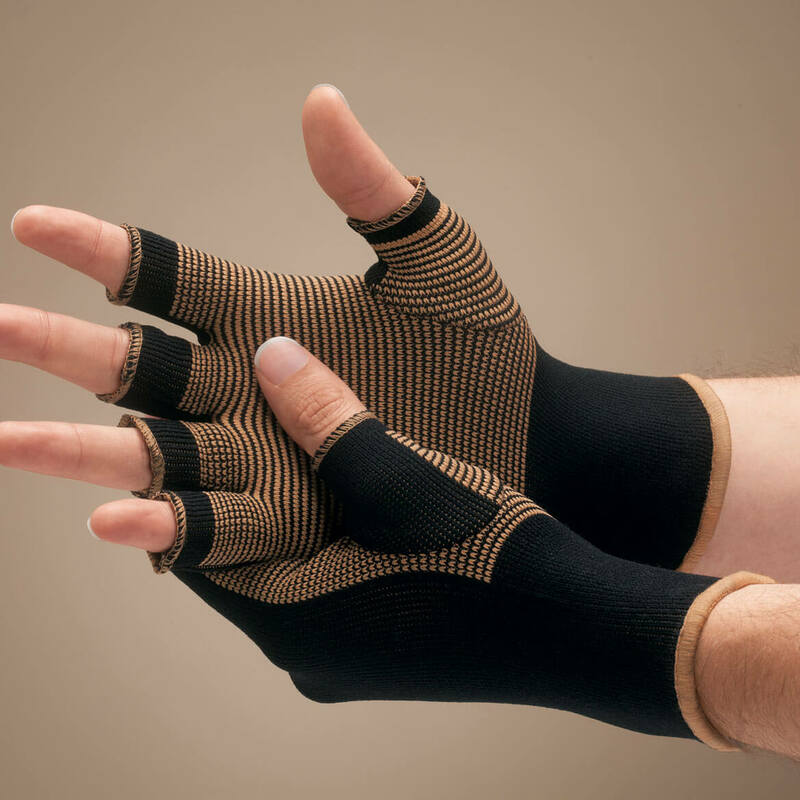 Wear the at night to help keep my hands warm & battle RA pain. I like the color-and design of the gloves. I have arthritis, and use these when I go out, especially now that it's Winter here. As I stated though, I wish these had stronger Compression, and different sizes, as in women's-Sm, Med., Lg. I myself, have small hands. 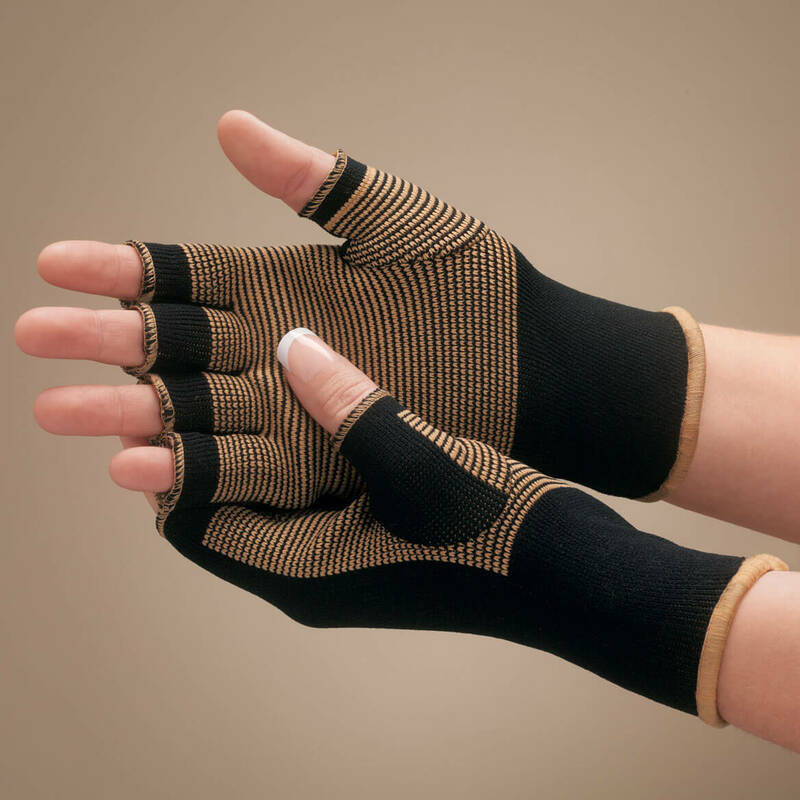 Relieves discomfort from swelling in my hands except for the seams around my thumbs. When I go to bed I wear it. It's just okay. The gloves feel good on the hand, but do not cover the finger knuckles enough. they need to be longer. First, my order took weeks to receive because of a computer glitch but I know that happens sometimes so that wasn't the problem. I have RAand bought these to ease pain. They fit very well but the thumb part tore loose from the glove on the fourth day of wear. I only wear them in the evening after work. Poor quality. 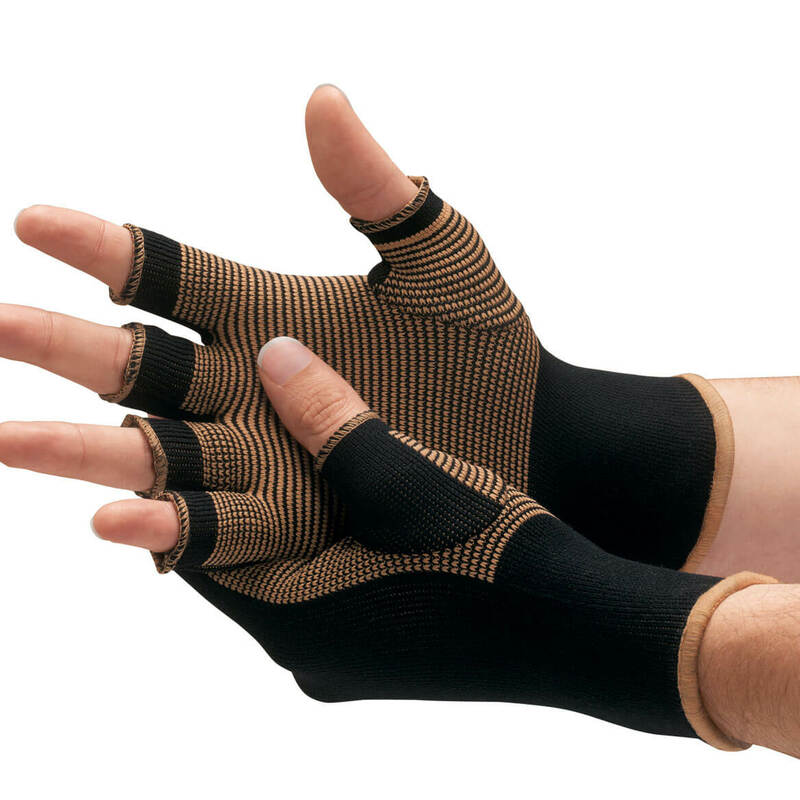 I wear these gloves every day for an arthritic thumb and they seem to help. Painful arthritic hands and hopeing these will give me some relief .. They are great and they really work !!!! hope they will help arthritis in my fingers! these gloves really help my aching hands. I read the review. I wanted to try. I have Arthritis, and osteoporosis I've bought these before and they are great!!! I know copper is good for pain and I'm having pain in my hands. I am having tendonitis and hope this helps my hands. 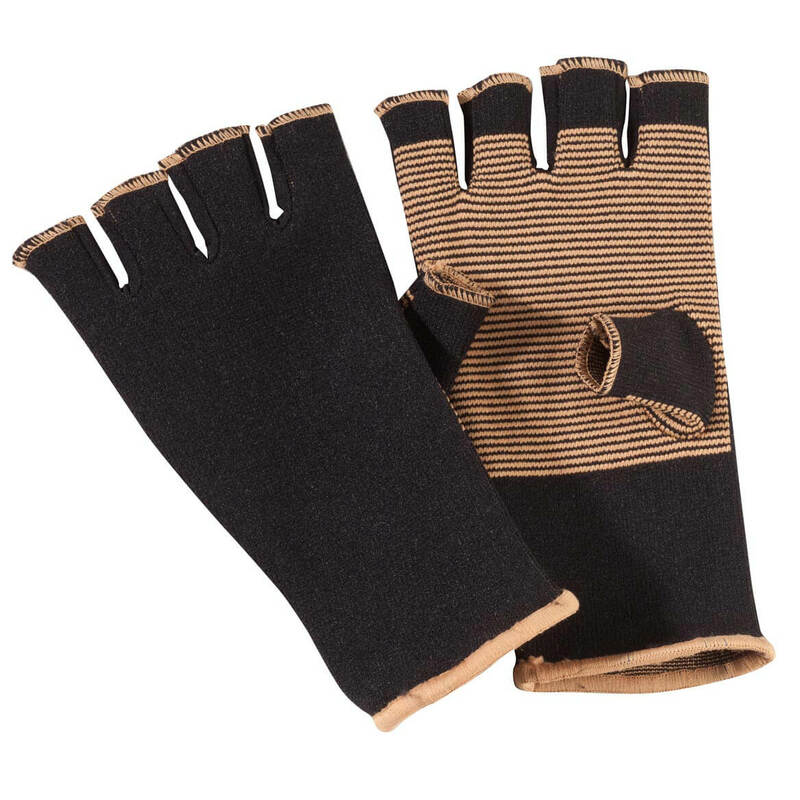 These gloves appear to have all the support I'm looking for to do the work I do as a package handler. Thank You. My husband has been having pain in his hand. Just thought I would order these to see if they would help. My hands hurt from arthritis-very sore and achy. I want to try this; heat sounds good. Maybe the magnets will help. I'm hoping these will help my oa and ra! Arthritis in my hands and they hurt, so I thought that I would give this a try. Hopefully it will ease the constant ache from the arthritis in my hands. My arthritis is keeping me from doing my crafts which I enjoy so much! They work very well to relieve the pain in my hands. what hand size is the glove? BEST ANSWER: Thank you for your question. The Womens 6 1/2"L-stretches to 9", 5 1/2" wrist circumference only stretches to 6". The middle of the glove stretches to fit a hand with a 7 1/2" circumference. The mens 7 1/2"L-stretches to 10", 6" wrist circumference only stretches to 6 1/2". The middle of the glove stretches to fit a hand with a 8 1/2" circumference. We hope this information will be of help to you. I guess I would wear a large in womens gloves. These copper gloves do fit my hands, even with swollen arthritic fingers, but I think the fingers in the gloves need to be longer. They do not cover the knuckles in my fingers. I have small hands. These gloves fit a tad lose on me. I like the compression on the gloves to be a little tighter. would they be good for bowling also have carpal tunnel as well? Are the gloves " one size fits all" in the men's/ women's sizes? Womens: 6 1/2 " stretches to 9" including fingertip openings, 5 1/2" wrist circumference only stretches to 6". Middle of glove stretches to fit a hand with a 7 1/2" circumference. Mens: 7 1/2"L stretches to 10" including fingertips openings. 6" wrist circumference only stretches to 6 1/2". Middle of glove stretches to fit a hand with a 8 1/2" circumference. how many gloves are in one order? BEST ANSWER: Thank you for your question. This is one set of gloves per order. We hope this information will be of help to you.